Harold proclaims this message on his radio talk show, Family Radio, to a world-wide audience. On the surface they sound like your typical american religious fundamentalists who believe in the literal truth of the King James Bible. They just seems to take their religion a bit more seriously than most Americans. ‘Arianna Ramrajie, of Ocala, Florida, has one she’d like to share. The girl who said this is 7 years old. If an adult wants to run off and abandon all their worldly goods to drive around in an RV littering, sure, go for it. But when they drag their kids along, how is that ok? I don’t think new laws are the answer (and probably wouldn’t be constitutional), and from that article I would say that arguing with them won’t accomplish anything either. I can only come up with one thing I can do. Ridicule them. Point and laugh at their stupidity. Mock them. Draw analogies to Jonestown, the Branch Davidians, Heaven’s Gate. Show how those all started as innocuous religious groups that then took the train to crazy town. We’ve still got a long way to go, but we’re making progress. Oh, leave them crazies alone Matt. So what if they’ve brainwashed some kid. Bad luck for her innit. Nope. I’m gonna keep pointing and laughing. Someday, being a religious goofball won’t be so socially acceptable. 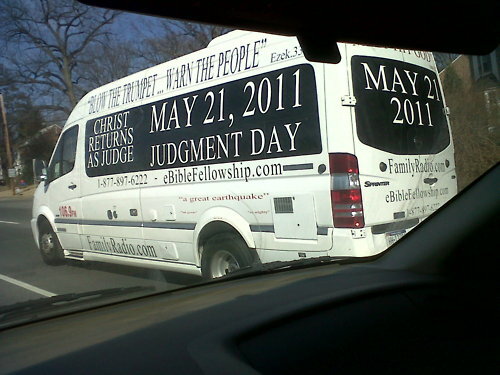 Harold Camping is a nut job. But, I must say, I’m glad he is doing what he is doing. We will be providing regular updates for 24 hours on May 21. I have a sneaking suspicion that we’ll be blogging again on May 22nd. Oh yes. Should be good to see the reactions the next day. Of course, ol’ Harold already predicted a day once years back, but after it came and went he decided he made a math error. I suspect another math error come May. I have personally seen more than one of these vans while driving around the south. It’s a scary experience because you are forced to realize that you are in the presence of a potentially unstable person. @Matt, Chey – Do guys remember the hilarious discussion we had at Mom and Dad’s last time you guys were here about scaring away baptists and Jehovah’s Witnesses that come to your door? Totally wanna run up to this person’s window and do to the same thing (speak in deep and demonic tongues, pull out hair, etc). Lol, that was a fun little discussion. Oh man, the hard-core fundie believers are such a trip. The goofiness knows no bounds. You guys are the kind of atheists that give the rest of us a bad name. You mean the bad name where main-stream politicians say we’re all immoral murderers who will burn in hell? They already do that. I’m just not going to take it sitting down. I’ll be happy when everyone recognizes the ridiculousness of religion.